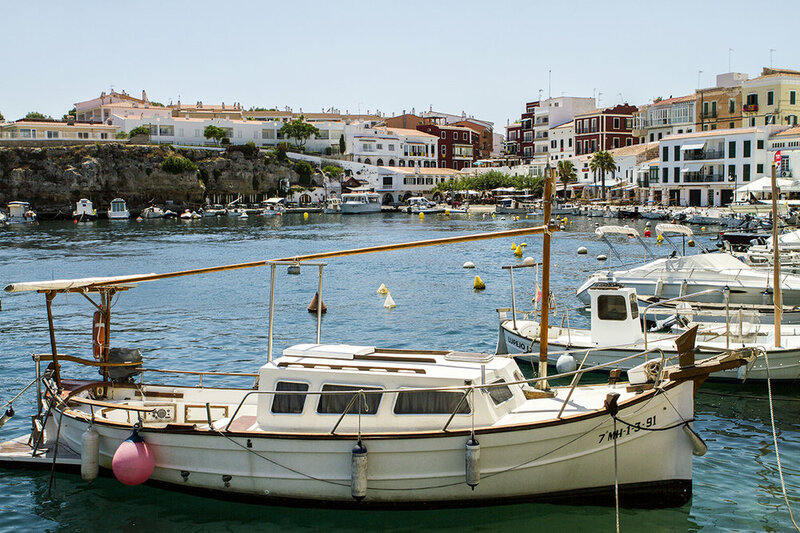 On the south-western tip of the island of Menorca is El Castell, a small town with a picture-postcard harbour, lined with low-key atmospheric restaurants and bars with a sense of sophistication. The area doesn't have any of the spacious sandy beaches Menorca is famous for; this part has a rugged landscape and a fortress that served to protect the island back in it’s Military days, but none the less, it’s still beautiful. Many boats sail through the estuary on the turquoise sea to settle in nearby Mahon, the capital, there’s even room for gigantic cruise ships to dock. The Barcelo Hamilton Hotel happens to be one great place to watch some of the majestic sail boats glide in. It’s one of Menorca’s five adult-only hotels on the island, a place to escape in the summer holidays without children running riot and dive-bombing the swimming pool. Having been to Mallorca many times, Menorca is a first. My auntie, who regularly takes a boat over from Mallorca, where she lives, told me it had wonderful beaches reminiscent of the Caribbean and she’s not wrong. Hire a car for the best way to explore the beaches and hidden coves such as Cala Mesquida, the nearest to El Castell. Then there's Alcufar, a good spot for locals and the slightly larger Punta Prima. Walkers might want to try a trek to Steven’s Cove from Es Castell where it’s great to swim from the rocks. The hotel is at the higher end of luxury for the Barcelo brand although still at an affordable price point, it's bright welcoming entrance is modern in feel; sleek corrugated steps leading to the spa and SA Cova restaurant below and a fully glass entrance with picturesque views to the water directly opposite. As well as the grander classic hotel entrance there's also a route in via a backstreet, which directly takes you to the hotel's more traditional feeling restaurant. It has a disguised domestic entrance and like many of the houses on the island, great things lie beyond a seemingly modest front door. Within the central part of the hotel are the swimming pools (one with a cover for not so good days) surrounded by sun loungers. The area is a little too small and claustrophobic for my own personal liking, surrounded by hotel balconies but it's defiantly a heat trap for sun worshippers. Snaking through the loungers it's dead quiet; most people reading, taking a nap or cooling off in the pool. Without the trampling noises of kids, it's heaven. But it's on the rooftop where the real appeal of the hotel lies; a large sunbathing deck complete with Balinese beds, cold whirlpools and a beach bar. At night time, the DJ sets the mood, the multicoloured chairs add some drama and the sunset paints the whole landscape a fiery red. You can even organise a spa treatment up here. Rooms are sleek, functional and comfortable. A junior suite with balcony is recommended. They are hot from the sun in the morning (el Castell is the first place on the Island to see the sunrise) and cooler in the evening. The bathrooms are cleverly designed with seemingly separate pods for the toilet, shower and sink area, and a double mirror. Only a few hotel rooms have baths so do ask for one if this is preferred. The main suite has its own hot tub. There are 4 deluxe suites with floor to ceiling windows and views to the coast although not with a balcony. I recommend lunch and dinner at the quaint SA Cova restaurant; a fisherman a style set-up with turquoise blue touches in the crockery reflecting the colour coming from the sea that's pretty much right next to you. Food has a tapas feel, the freshest calamari I've ever had. The setting is peaceful and special. On the roof terrace at night, try the 'Brinner'. A strange concept that I still can't get my head around but fun and suited to the vibe of the restaurant. Our waiter, Bobby, recommended a delicious gin served with strawberries and we sat on the roof on fun light- changing chairs and dive into our food. As Menorca is a small island it doesn't take long to drive out in any direction for a day trip. Wine lovers should absolutely head to the Binifadet vineyard for a tour and tasting. It's drop dead beautiful, wisteria clad archways that shield tables from the heat of the sun. Coincidentally, my boyfriend’s mum also came here recently and they decided to visit a few times. They loved the outside bar at the entrance, a casual laid back yet cool vibe where locals gather early evening for a sundowner. Speaking of which, if you can put up with a slightly crowded sunset stop then you must head to the Cova D’en Xorxoi, perhaps Menorca’s coolest bar. Not only is it nestled in the side of the cliff edge it's also achingly hip and at the right time of year the sunset casts a golden glow over all those selfie images. Yep...people really do go a bit mad with the selfie sticks here and it's a little irritating but they can be forgiven; it’s really quite special. My top tip? Make sure you reserve a seating area or you’ll be pining enviously at those seats all night. I fell in love with Menorca. It's relaxed vibe, brilliant weather and marvellous scenery meant it pulled at my heart strings. And I can't wait to go back.